What are the signs of a breach? Are you catching them all? Or do you have a false sense of security (yes, pun intended) when it comes to all things cyber within your organization? How about your systems, applications, data, end users and business partners? And how about your accounts and the business services you use to run the company? “One mustn’t forget: being compliant and being secure are two different things,” says Demetrios Lazarikos (Laz), founder of Blue Lava. Research from Accenture might help you answer these questions. According to the global management consulting and professional services firm, organizations are preventing most (87 percent) but not all of the targeted attacks that come their way. While 87 percent might seem like a decent number, it points to the fact that some attacks are still making it through (or around) the defenses that companies are deploying. Or perhaps, more likely, the attackers are walking right in, since no protections are in place in some instances. Further to this point, the same Accenture report states that companies are still facing two to three security breaches per month. Again, to emphasize the obvious, just because a company has achieved a point-in-time state of compliance for PCI-DSS or HIPAA, for example, doesn’t mean they are immune to attacks and the potential for a breach. “As companies are building out their security program, it’s imperative that they recognize that the program is a constantly evolving solution that must not only address the compliance requirements but also align to the business requirements,” adds Laz. What’s more troublesome, perhaps, is that 71 percent of those included in this same Accenture survey say that cyber attacks are still a ‘bit of a black box,’ and they do not know when or how attacks will impact their organization. Of course, this generally refers to the detection of the attack payload itself; the detection may be possible if the systems or data are damaged, destroyed, or taken offline—not so much if the data is slowly extracted from the organization under the radar. What this scenario highlights is that the data is lacking and/or being misread. Therefore, it’s really about analyzing data. One could argue that it always has been, but statistics like these make it easier to justify. The bottom line: if your company’s systems, accounts or data have been compromised, you probably don’t know it yet. And, therefore, the answer to the questions from this article is that you’ve been coasting on a false assumption of security and protection. Still don’t believe the hype? Let’s go back to Accenture’s study for one more statistic. It seems that security teams are still only finding 64 percent of the attacks they face, and only 24 percent are able to detect less than half of all breach attempts. More proof behind this failure to protect can be found in another study, this time by Verizon. Verizon found that only 14 percent of the responding organizations had implemented even the most basic cybersecurity practices. That means 86 percent have not! And when the breach is finally detected, there’s often a significant time gap between the initial breach and its detection. While 10 percent may seem like a small percentage in the grand scheme of things, this number of companies that this figure represents is actually very troubling. Adding salt to the wound, these companies are also taking longer than one month to detect a breach. The fact that companies don’t know when attacks occur is not all that surprising. “Unless we are talking about intentionally visible attacks like ransomware, wiper malware or hacktivism, in a majority of the cases there is no easy way to tell,” says Rene Kolga, Senior Director of Product Management with Nyotron. Assuming you have been breached and don’t know it yet because, as Kolga said, “there is no easy way to tell,” how can you spot it? Learning from the consumer world that has been trained by anti-virus marketing tactics, most people would know to look for ‘slow’ or ‘sluggish’ machines. “In some cases, like with crypto jacking, organizations can detect unusually high and prolonged CPU utilization,” says Kolga. Looking beyond a slowed down system, you actually have to prepare yourself for the act of monitoring and looking for activities, behaviors, and remnants of these things within the organization. Without this preparation, you are missing out on a lot of opportunities to help yourself. Granted, monitoring in real-time can be overwhelming. “There is no such thing as a single sign of compromise. If such a simple indicator existed, smart attackers would find a way to disguise it.” - Greg Scott, senior technical account manager at Red Hat and author at Infrasupport. So, what are the other signs and places to look for them? Part 1 of this series will attempt to do the impossible by focusing on how to spot the breach by using some signs that likely exist in a breached environment. Aside from machines running sluggishly, one of the closest consumer-like signs you can spot is that of unexpected system reboots. As a one-off event, these may not seem like much. But repeated activity in this area—or a series of these events across many systems in the organization—can be a sign that something is off on one or more computers in the organization. “Unusual reboots can be an indication of compromise,” says Jakab. Also, be sure to look for servers or desktops running unknown processes. Another sign that’s close to the consumer-like signs that we look for as home users of computers is that of unusual application behavior. Sure, sluggish applications could be a sign that an application is doing something it shouldn’t be doing, but the signs can go way beyond this. “Sophisticated attackers use living-off-the-land techniques such as abusing legitimate administrative tools like PowerShell, WMI, etc.,” says Kolga. IP addresses are used to identify “things” on a network that are attempting or succeeding in their access to and communication with other resources on the network. Each organization will have a collection of IP addresses associated with the things they’ve installed on their network. Beyond that, everything connecting with an IP address that doesn’t fit should be looked at suspiciously. “Seeing your customer log in from a distant country versus the location they originally signed up from is another example,” adds Balasubramanian. When cybercriminals compromise a system, they generally try to find ways to move laterally across the network within the organization. This lateral movement is often going unnoticed. Adds Desko, “We often see password guessing against externally-facing login pages as a prime avenue for cybercriminals. We call this password ‘spraying.’ Some of these systems come inherent with logs and reports that can be viewed to spot these hacking trends, and you will see many invalid attempts in the logs over a period of time. These attacks typically guess one common password against multiple user names (spraying) rather than lots of different passwords against one user (brute force). It requires some technical expertise to get under the hood and review this. Compromise of email systems can be very damaging; we often see that people are pack rats and store sensitive in their email that has no business being there. There are reports in certain systems (e.g. Microsoft Office 365) where organizations can view ‘impossible’ logins." “A spike in activity beyond the normal threshold on an account could be a sign of a compromise,” adds Balasubramanian. For login analysis, again, logs are your best friend here; in this case, these logs can be located anywhere access is managed and logins take place. Looking for changes in the behavior of privileged users, such as login time and systems accessed, can indicate that systems are compromised. Cybercriminals attempt to capture these accounts and use them to their advantage all the time. Oddly enough, signs don’t always have to point to something that legitimately exists. Fake email exchanges are particularly frustrating for InfoSec teams. The Verizon 2018 Data Breach Investigations Report reveals that 96% of attacks come through user inboxes. Email remains the favorite entry point of many attackers, according to Kolga, and Benishti points out, "If a company traditionally receives an invoice on the second week of the month from one of their supply chain partners, and one month they receive the invoice during the fourth week of the month, then they should view that message with extreme suspicion. The same suspicion should be applied to random internal emails. For example, if employees do not receive regular emails from HR about payroll, but several employees receive a message one morning asking them to take an action, then those employees should immediately report that email. In summation, any message that defies what is classified as ‘normal’ should be immediately recognized as a potential attack underway." Even if the exchange appears to be real, it’s important to be suspicious of exchanges that could have an immediate impact on the business. “An unusual email from the CEO to the CFO instructing her to wire money urgently to an account is also a sign,” adds Liwer. Blocking incoming spam has always been a priority in order to avoid internal users from wasting their time deleting emails – or worse, clicking on something malicious. But outgoing spam, where a cybercriminal attempts to spoof emails as if they were being sent by someone inside the company, can be damaging too. Receivers of such spam may form a negative opinion of your company or even use the spoofing to conduct the fraudulent activity under your company’s name (domain). Our desire to access email anywhere, anytime, makes this a bigger challenge for organizations. Sometimes, you have to ask your staff to understand what’s happening in your environment. Many times, email settings are never touched; companies use the defaults that come with the software if on-premises or the service if running in the cloud. Even if the company changes the way their email processes are defined and how email is handled, it may not be reviewed for months or even years. This could lead to trouble. Email settings and configurations can sometimes be tampered with by cybercriminals so that harmful emails can find their way into and out of a company. There are also cases where settings were inadvertently configured incorrectly, leaving holes open for data to leak or bad actors to enter. Asking end users to be on the lookout for improper settings can serve as a good back up to the technical controls. When we think about identities, we tend to think about people. We’re somewhat inclined to forget that our computer systems—even some of the services running on them—have identities, too. As with most of the other items above, security teams are advised to constantly monitor event logs so that suspicious activities are identified and responded to in a timely fashion. In this instance, it’s suggested that security teams look for server-side input validation failures which can be logged with sufficient user context to identify suspicious activity. Signs of human compromise—employees, contractors, and business partners—can be more difficult to spot. Companies need to have an inherent trust in the people they bring on board to help them run the business, so it may be difficult for people within the company to observe and understand that a fellow employee or a third-party vendor is acting suspiciously. Strange characters that appear in a database might be attempts for an SQL injection attack. They may also be a sign that the data has lost its integrity and can’t be trusted for accuracy. Oftentimes, people are so concerned about what is coming into the network that they don't think about what is leaving the network. Once an organization is compromised, if stealing data is the goal of the cyber attacker, they will try to exfiltrate the data in some way. “Using native tools within the existing infrastructure (e.g. Netflow in routers/switches/firewalls) is very helpful in spotting trends and anomalies of the data leaving the network,” says Desko. Last, but not least (and hopefully not the way you spot that you have been breached! ), is finding your company’s information online. This may sound easy but may not be the case. San Soucie continues by providing some tips when looking for these signs. If you truly care about your data or are in a business where there is tremendous liability if data is exposed, you almost have to use a professional monitoring company, suggests San Soucie. It’s one thing to know where to look. It’s another to know what to look for. Cybercriminals who have a bit of patience, however, can make things a little more difficult to spot. 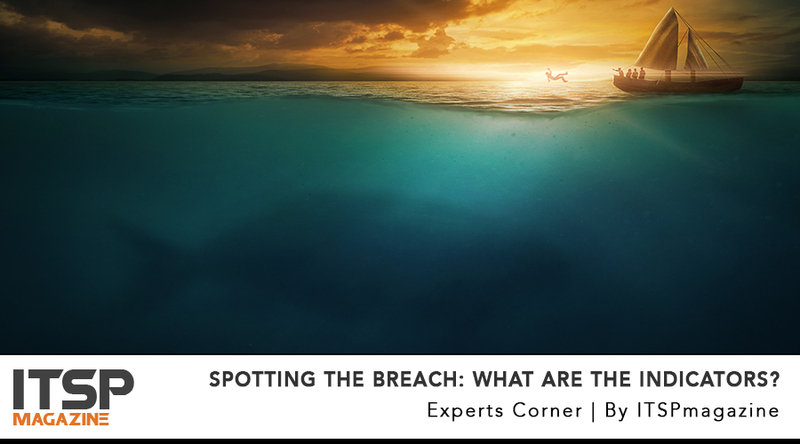 If we find good response to this Part 1 of this topic, I may work on a Part 2 where we, the experts and I, will look at the potential impact of a breach and what some of the next steps might be once you spot it. For now, we hope you enjoyed and will benefit from reading the “Spotted” tips that our experts provided. As we mentioned at the beginning, checking the signs for potential breaches is critical. But remember, even if you don’t spot these signs, it doesn’t mean that you haven’t been breached. We recommend that you rely on multiple security monitoring tools—and maybe even some partners—to keep your infrastructure safe. Newer PostWhat Is A Next-Generation Firewall And Why Do We Need It?